I may need a tortilla press, or at least something that will function as one. The other day we made fish tacos, complete with halibut that my family caught in Alaska, and a slaw made with fresh turnips and cabbage. I bought some masa harina (a Mexican flour traditionally used in making tortillas and tamales; it’s basically a very fine cornmeal, though it’s specially prepared, so regular cornmeal can’t be used as a substitute) a few weeks ago, and I’ve been itching to make something with it, so this was a perfect opportunity. The recipe is simple – incorporate the shortening into the flour and salt until crumbly. Add water slowly (may need slightly more or less) until a stiff dough is formed. I read somewhere to let the dough rest for up to an hour, so I did. 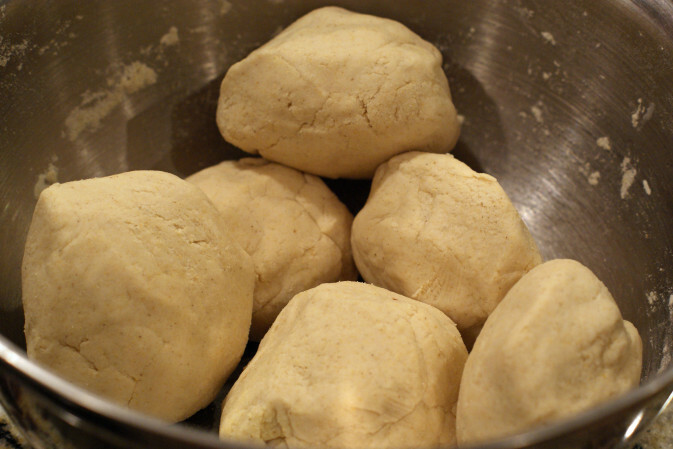 After resting, cut the dough into 6-8 even chunks, and form into balls. Now it gets messy. Here’s where the tortilla press would come in handy. I started by trying to roll the balls out on a floured counter with a rolling-pin, but the dough alternately stuck to the counter and/or the rolling-pin, and continued to pull apart. I then tried to roll out on a heavily floured counter with a piece of waxed paper on top, which offered some more success, but still stuck more often than not. Very frustrating, as S can attest. In any case, I eventually got each tortilla rolled out thin enough to cook, though it took more time and effort than I was expecting. To cook, heat a skillet, and add a tortilla. Flip after only about a minute – they cook fast and you don’t want to overdo them. When they’re finished, many people recommend keeping them in a clean kitchen towel so they don’t dry out (and stiffen up) before they’re ready to be used. I didn’t do this, and I didn’t have any problems, but I only made six. 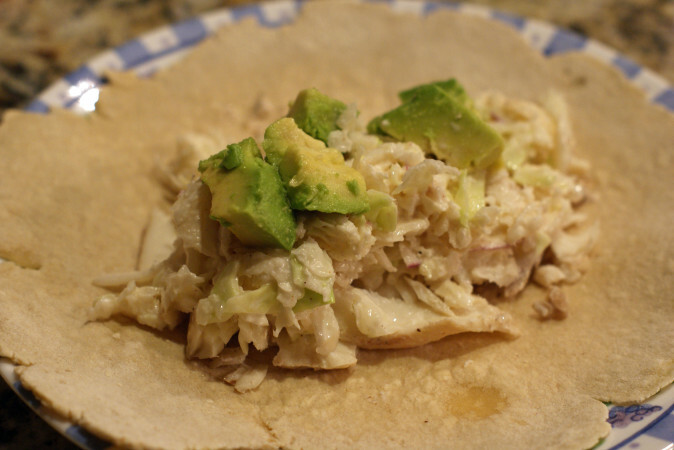 To assemble the tacos, we used some flaked baked halibut. The slaw was made with shredded turnips (2 medium), shredded cabbage (1/4 head), some mayo (1/4 cup? ), juice from 1/2 an orange, and some salt. We also added a little Tabasco sauce when it was on the tortilla; probably should have just added it to the slaw. The tortillas did taste good, since of course, fresh doesn’t compare to prepackaged and store-bought. The tacos were very light and fresh. The tortillas were a pain to make (really, just the flattening part), but don’t let that discourage you from making them. The recipe’s easy, and if you have the right tools, the entire process should be pretty simple.